Last night's episode of "The Office" felt like a lot like it should be the end of a series, not just the end of Michael Scott. When Dawn and Tim got together after the third season of the British series of "The Office," it made sense to end the show. The story ended. Some fans argued that after Jim and Pam got together on the US version, "The Office" should have gone off the air. But after a few mediocre episodes (and seasons) their wedding and the birth of Cece kept it moving. 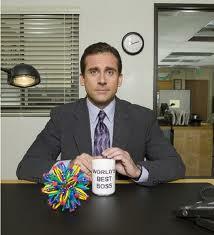 Since, the most interesting thing about "The Office" has been Michael and his search for love. Without Jim and Pam ("Jap," as Michael said just a few episodes ago) and Michael and Holly (Molly? Hichael? ), what are we left with? Michael said goodbye to just about everyone at Dunder Mifflin, giving us a hint at who or what might be the story once he's gone. First, the Erin, Andy, Gabe love triangle. When Erin started on the show and Andy started courting her, it was super cute. Not Jim and Pam cute, but you know, OK to watch as a secondary storyline. Then, when she got together with Gabe, it felt forced. They were never cute. Actually, I thought the pair was pretty appalling, though I think that had a lot to do with Gabe's Lady Gaga costume from Halloween. As appalling as Gabe following Andy into the bathroom? Or, worse, as Gabe walking into the women's room to try to win Erin back after she humiliated him last week? He reached a new level of gross with those moves. But think about Andy's role in this. He hasn't indicated that he's still into Erin in a while. Even though Erin admitted to Michael last night that she might be in love with him, since we haven't seen them really interact in several episodes, I'm not sure there's enough there to build the show on. Then, Will Ferrell. Deangelo Vickers showed some significant cracks in his rosy demeanor last night. Not only did he make the most disgusting marshmallow sandwich ever (and I like marshmallow sandwiches), he botched a sale with Andy. I know he only has one episode left, and with the likes of Ray Romano and Jim Carrey doing cameos in the next few weeks, I suppose the story of the new manager might be interesting. However, that's only going to stretch to the end of this season. Next year, he or she is going to have to be a fully integrated character, jiving with the tight chemistry of the rest of the cast. And that's a tall order. Finally, Darryl. Darryl is one of my very favorite characters on "The Office." He's taught Michael to say phrases like "flippity flop" to seem more street, and the outcome has been priceless! Michael gave Darryl the book on management he's been working on (Tip: People always like the guy who offers them a stick of gum. ), which might foreshadow Darryl's ascent to the big man's office. That would be cool and all, mostly because Darryl likes to take his shoes off at his desk and so do I. But where is Darryl going? He seems pretty settled to me, which doesn't make a good storyline. Of course, there's always Dwight to make a scene and Jim and Pam to talk about their annoyingly cute baby. However, without Michael, will his favorite workers lose their charm? I worry about them becoming flat. And as Michael advised Kevin last night, "Never be a caricature." This level of sentiment permeated many of the moments Michael took with a co-worker to say goodbye. At times, it was right on key, like when he told Erin to call him anytime because she doesn't have her birth mother to talk to. Other times, it was false and syrupy, as when Michael poured on the love for Phyllis and her homemade mittens. Last week's lovely goodbye song just couldn't be topped. It was funny, reminiscing, and really touching—though I do admit to tearing up last night when Jim told Michael he was the best boss he ever had. And when Pam ran through the airport to hug Michael goodbye. And felt a sort of surge of happiness when Michael took his microphone off and gave it back to the ever-present camera guys. When Michael walked out of the office on his way to the airport, the last image he saw was everyone still at their desks working. Dunder Mifflin will go on, business as usual, without Michael Scott. The question is, can "The Office?"